I'm sure you've noticed that several of our products have been "temporarily out of stock" for a couple of weeks. Running out of your favorite sprouted items is a highly stressful situation for me because I know how much you want what you want when you want it. Please accept my apology for the delay we have encountered getting Quinoa and Einkorn back in stock to sprout. Also, for introducing sprouted Corn Grits only to discover that our machinery was not adequately removing the grain husks. Our new grits separator has arrived and is being installed in the next few days. I should be breathing again real soon. A few months ago we introduced the True Sprout Certified program and web site that will serve to educate everyone looking for information on quality sprouted products and where to find them. We have added several articles and links to resources to learn more about the healthful benefits of sprouted grains and flours. You will find this information at www.truesprout.org. We will be uploading a listing of quality sprouted products and store locations in the coming weeks and we continue to work with a core of experts in the scientific field to identify measurements and benchmarks for truly sprouted flour. Many of you have inquired about the sprouted gluten-free granola we made available last year on our web site. I'm very happy to announce that it will be available again this summer. The granola is my original recipe so a couple of friends and I have decided to make it ourselves, along with a line of gluten-free sprouted cookies. They will be available under "Girls On The Farm" brand and will be for sale on our website www.healthyflour.com and in retail stores around the country. 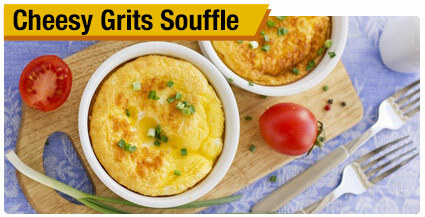 This month's recipes include a great yeasted waffle and gluten-free waffle and southern comfort cheesy grits souffle'. I hope you enjoy them. Happy baking to you! This recipe accompanies grilled shrimp to a tee. Preheat oven to 350 degrees. Generously butter a 9x13 or 3-quart baking dish. Freeze for 10 minutes. Bring 3 cups of water and 1 teaspoon sea salt to a boil in a large heavy saucepan over medium-high heat. Gradually whisk in grits and return to a boil. Reduce heat to medium-low and cook, whisking often for 3-4 minutes until thickened. Whisk in milk and cook, stirring constantly for 5 minutes or until grits are creamy. Remove from heat and stir in corn, next 7 ingredients, and the remaining 3 teaspoons of sea salt. Spread mixture in the prepared dish. Place on a parchment lined baking sheet. Bake at 350 degrees for 50 minutes or until puffed, firm around the edges, and slightly soft in the center. Remove from oven to a wire rack and cool for 5 minutes before serving. Sprouted cornmeal adds a great texture. Preheat oven to 200 degrees. Place a large baking sheet on middle rack. Whisk flour, cornmeal, baking powder, soda, and salt in a large bowl. Lightly beat eggs and sugar in a medium bowl. Add buttermilk, oil, and vanilla. Whisk until well blended. Add the wet ingredients to the dry ingredients, stirring just until combined. Preheat your waffle iron. Lightly coat it with olive or coconut oil. Add enough batter to cover about 2/3 of surface (about 2/3 cup). Distribute batter evenly across surface. Close and cook until golden brown - 4-5 minutes. Transfer the waffles to the baking sheet to keep warm until ready to serve. Don't stack so they'll stay crisp. Butter them up, add your favorite syrup or fruit sauce, and serve for a yummy breakfast. I love the slight fermented taste of these waffles. The cornmeal and Apple Cider Syrup make them extra special. Stir baking soda into batter. Preheat waffle iron and brush lightly with coconut or olive oil. Cook waffles until golden brown - about 4-5 minutes. 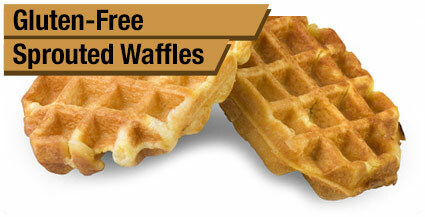 Keep finished waffles in a single layer on a large baking sheet in a 200 degree oven to stay crisp. Combine all syrup ingredients in a medium saucepan. Bring to a boil and reduce until liquid coats the back of a spoon - 10-15 minutes. 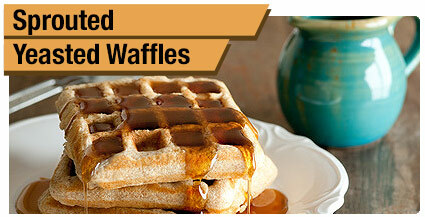 To serve - butter up your waffles, drizzle with cider syrup and dig in!